I know I’m a little late with this update, but it’s been a pretty hectic few days over here lately. While I do want, and need, to clean out my closet, it definitely hasn’t been at the tip-top of my priority list. Despite being super busy, I have managed to go through my shoes. Shoes have always been a problem area for me, but it really exploded when I got to college. After I got to college I no longer had my parents watching my spending and seeing all the new shoes and clothes coming in the house. 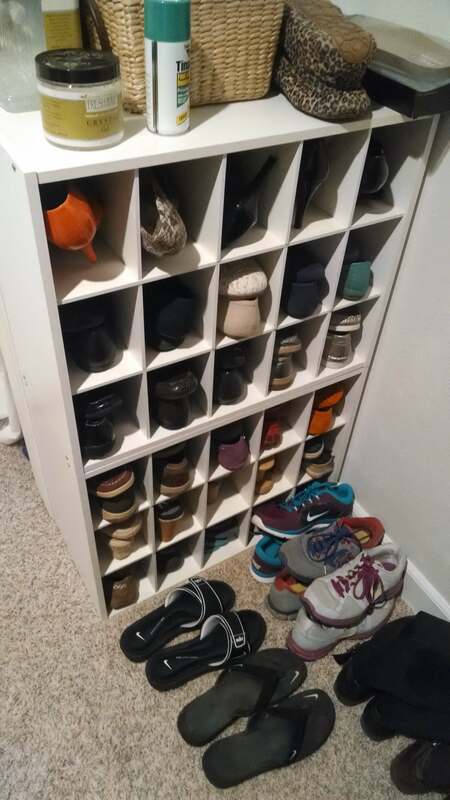 When I went through my shoes last year, I went from about 88 pairs of shoes down to about 66 pairs of shoes. 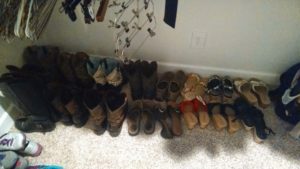 Since then, I did have a little shoe creep as I bought 3 pairs of shoes since then (I think). It filled up an entire 13 gallon trash sack! Don’t worry, I won’t be throwing these perfectly good shoes in the trash. I’ll be holding on to them for what has, somewhat unfortunately, become my annual yard sale. 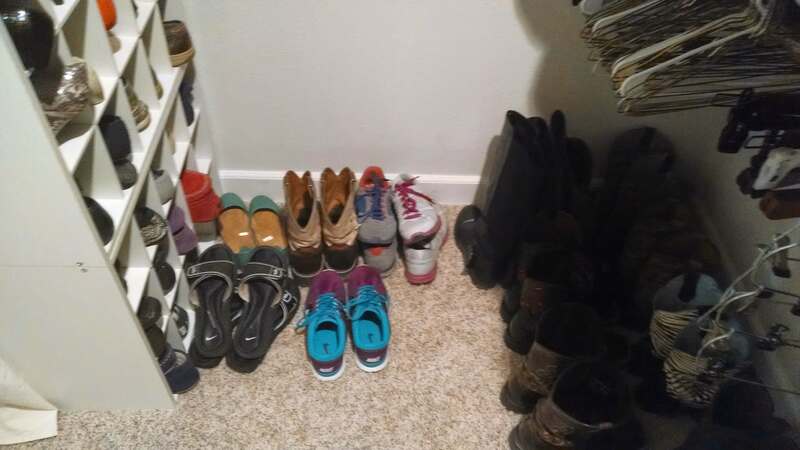 I don’t know if you’ll be able to see much of a difference, but here’s what my shoes looked like after I was done putting them all away. I re-arranged them a little bit so all the boots are together, all the tennis shoes are together, etc. 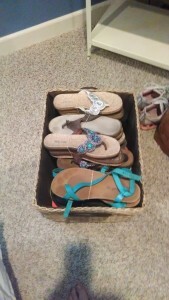 I was also able to empty out the basket that used to contain my sandals. 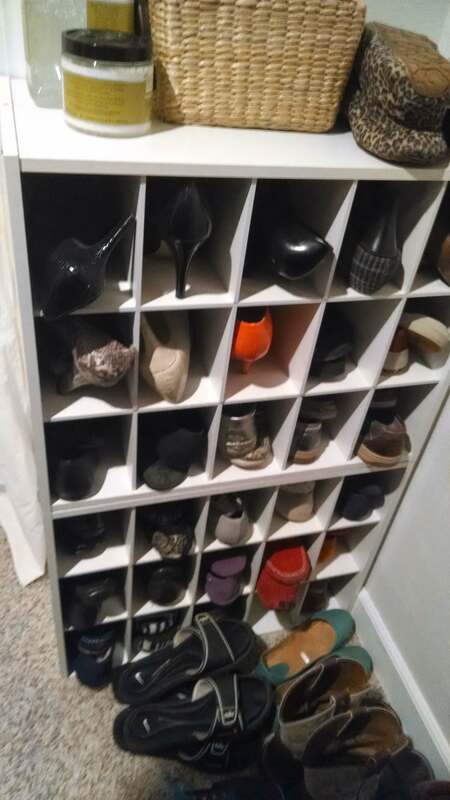 Now there’s room for my sandal in the closet with the rest of my shoes. 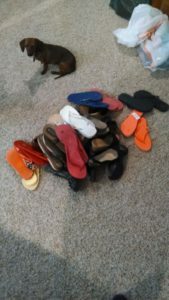 This will make it easier for me to see what all sandals I own so I can get to them and wear them more easily this summer. By my math, I’m down to only about 50 pairs of shoes now. That’s still a lot, and I might continue to get rid of some more as I work on cleaning out my closet, but for now I’m happy with my progress. Up next: Tackling my clothes. Yikes! 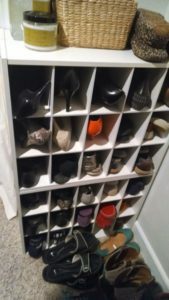 Is your clothes closet in need of a clean out? Going from 91 (with the three new pairs) to 50 is quite an achievement! I’ve never been a shoe person particularly but I have other problem areas where more and more just seems to accumulate to the point that I could never use (or in your case wear) them all. It’s good to cut down some, even if it’s not “getting rid of every single thing.” Congrats! You’re getting there, Kayla! Wonderful work! 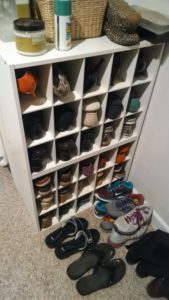 What is your “goal” number of shoes? Do you have one? I actually don’t have a goal number, but maybe I should… I do have a goal to do one in one out from now on whenever I get a new pair. I think your blog is aptly named, Kayla! That is several more pairs of shoes than I own. 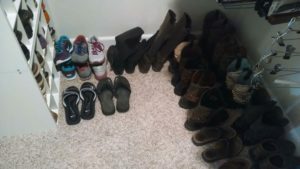 I recently got rid of about a dozen pairs of mine as well, because I found that I was never, ever wearing a bunch of them. 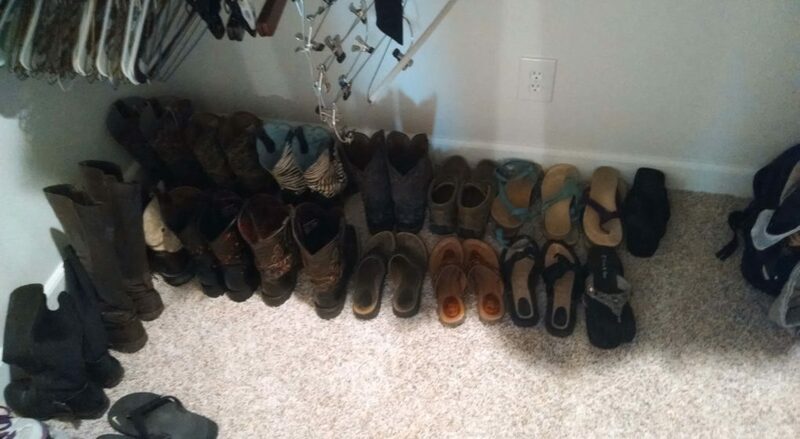 For some, it made me sad, but I really don’t get a chance to wear very many different pairs, so they are better off not collecting dust in my house. That’s exactly what I decided too Anne. There were lots of pairs that I hardly ever wore, some of them didn’t get worn one time since I did my last clean out in January 2014, so I knew it was safe for them to go.